JULIUS JOTTINGS. OCTOBER, 1900. No 3. George was born in India in 1804. His parents soon afterwards returned to England, and settled at the Old Palace, Richmond, and George was brought up to the medical profession. He began practice with his father, but not for very long, and on his marriage, in 1829, to the beautiful Miss Spaight (*), he went to live in Ireland. His wife died in 1840, and leaving a daughter, Ethel, to be brought up by her grandmother, Mrs. Spaight, at the Hermitage, Castle Connel, co. Limerick, he went to live with his three boys at Wakefield, in Yorkshire, and sent them to a day school. In 1844 he married Susan Thorley, the only child of a wealthy old friend in Richmond ; she died left him with another baby girl, Ella, who became the charge of his niece, Julia Quilter. Dr. Julius was very unhappy, and buried himself in the wilds of Ireland, with his three boys. Whilst on a visit to Mr. Spaight, at the Hermitage, the house was nearly burnt down, and his boys had a narrow escape ; the bed in which two of them were sleeping was in flames, and Dr. Julius was only just in time to rescue them. He has shown me part of the charred bed hanging, handsomely worked by hand, which he always kept. Very early in life his son Reginald went to seek his fortune in New Zealand, whilst Herbert and Edric practiced as solicitors in Maidstone, and at Holt, in Norfolk. After a time they joined their brother in New Zealand, and Dr. Julius settled at Washfield, in Devonshire, with his brother William, a retired major, and his niece, Julia Quilter, and her charge, Ella. He spent some happy years in beautiful scenery, for which he had a painter's appreciation, doctoring the poor people, by whom he was much loved. Later on he spent two years at Willey Mill, at Wrecclesham, with Ella, and then took a little house near Brecon, in South Wales, a very beautiful part of the country, moving later into Peterstone Court. Whilst here he entered into and thoroughly enjoyed county society, for which he was eminently fitted, and also spent much time in fishing. During a visit with her father to his, sister at St. Leonards, Ella contracted typhoid fever, which developed on a visit to Wrecclesharn, and of which she died at the age of 25. This was a sad blow and lifelong sorrow to her father. He left Wales, and after a time settled at Seale, near Farnham, where later on his son Edric, now an invalid, and his widowed daughter-in-law, Mrs. Reginald Julius (Catherine Cameron), and her three children joined him, and remained with him to the end of his life. He died at Tilford, near Farnham, in 1885, aged 81, and was buried in that pretty churchyard by the side of his brother, Mavor Julius, and his niece, Julia Quilter. He was a fine,looking man, about 6ft, 2in. in height., fond of art, music, and painting, a, fascinating talker, fond of society, and yet shrinking from it, a reader of every kind of literature, a good classic scholar, and also a lover of Nature. Fishing was his favourite pastime. He was not a successful man, and perhaps this made him rather morbid. He was very kind-hearted, and greatly loved by the poor wherever he lived. He was a very able man, and would probably have done well in his profession if only he had kept to it. (*) Said to have been an unhappy marriage - Pg 30 "A power in the Land"
George C. Julius of Surrey studied medicine there for three sessions. 1821-2 Chemistry, Materia Medica, Anatomy. 1822-3 Chemistry, Clinical Medicine, Botany. 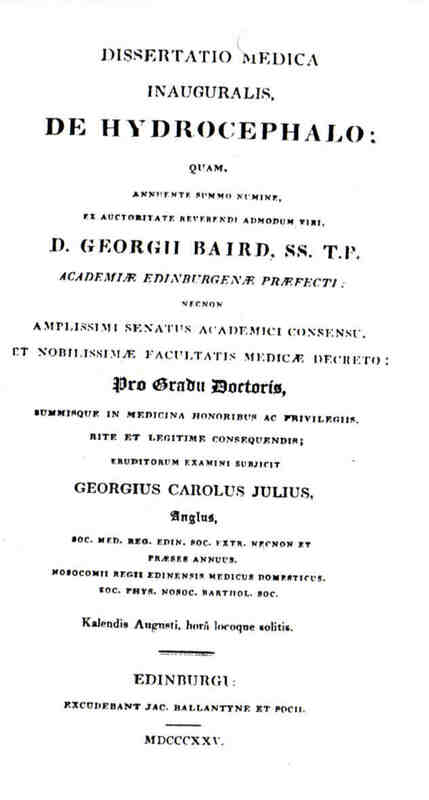 1824-5 Institutes, Practice of Medicine, Anatomy, Chemistry. He graduated M.D. in 1825 with a thesis entitled De Hydrocephalo and was one of the president's of the Royal Medical Society of Edinburgh, a student society, in 1825. Translation of Notice of George Julius thesis. D George Baird S.S. T.P. published by James Ballantyne and Coe at Edinburgh 1825. December 12. Henry Willmer and George Charles Julius the younger, Baker Street, Portman square, Middlesex. Surgeons. Willmer Henry and George Charles Julius Jr., surgeons, Baker Street, Portman Square, 12 December - Debts etc by H Willmer. Ref: Perry's Bankrupt Gazette Saturday, 6 March 1830. JULIUS JOTTINGS, January 1900 No 1. Pg 10. Maria Louisa Brewin writes: " Part of this time his eldest son Dr George Charles Julius was practising with his father, and for his services to a young Princess was presented by King William the IVth with a silver vase dated september 18th 1833, which is now in the possession of his grandson Bertie Julius of Tilford". GEORGE CHARLES JULIUS Jun'. M.D. The daughter of the Lady A.K. Erskine. Monday . . . . .
& . . . . . Allsa. . . . .
1. Messrs Rundell and Bridge silversmiths & Jewellers of Ludgate Hill. 2. Lady Augusta Gordon fourth illegitimate daughter of William IV then Duke of Clarence by Dorothea Gordon. Julius. On the 1st inst, at Clermont House, Tilford, Farnham, Surrey, George Charles Julius, Esq, MD, aged 81. MEMORIAL AT TILFORD CHURCH SURREY. George Charles Julius b. 9 August 1804 d. 1 December 1885. Caribbeana Vol 3 Pg A76. Arms of Julius impaling Argent, a fess Sable between three martlets. 1. Census: England, 30 Mar 1851, Wakefield Yorkshire. George is recorded as head of house married aged 46 Physician MB of Edinburgh MRCS of London born East Indies. 2. Census: England, 8 Apr 1861, Willey Mill London-Southampton Rd Farnham SRY. George is recorded as a widower aged 56, M.D. Edinburgh, member of the Royal College of Surgeons, not practising, born East Indies Bengal, head lodger. 3. Census: England, 2 Apr 1871, 2 Old Palace Richmond SRY. George is shown at the home of his brother Frederick aged 66 born in Bengal. 5. George Charles Julius: Will, 24 Sep 1885. On 29 December 1885 Probate of this will with one codicil was granted to Arthur Onslow Julius and Catherine Robertson Julius widow the executors.